The witching hour, in the mind's eye of our youths is after midnight on a Friday night when forgotten horror films were broadcast on outlaw channels by celluloid conjurers. Within the shadows of this wondrous time lie broken memories and shattered dreams, an amalgam of cold war paranoia, psychedelic experimentation, and a realization that the dreams of our forefathers were illusions. However, as these truths reveal themselves, life continues on, evolving, creating, and destroying. 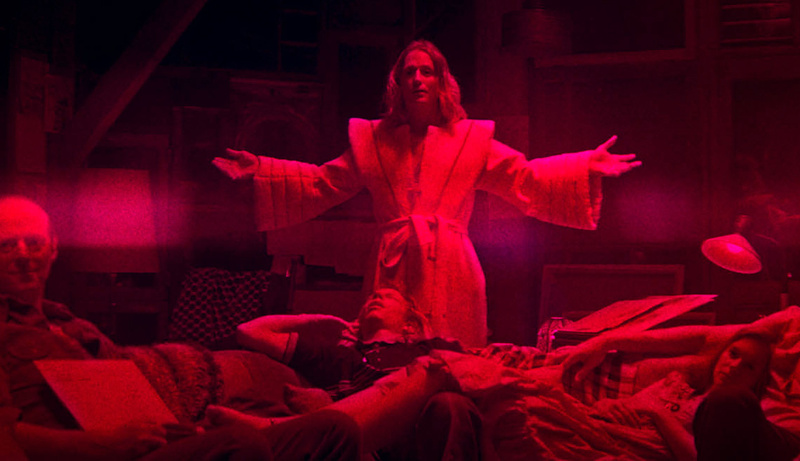 It is destruction, more specifically unimaginable bereavement that is the centerpiece of Panos' Cosmatos' twin masterworks Beyond the Black Rainbow and his latest feature, Mandy. Where Rainbow is an exploration of power, control, and escape, Mandy is the karmic opposite, delving into a tangible, all too American hell where the concepts of rage, loss, and love are vivisected on an altar of bibles and bodily fluids. From initial scenes of ominous crimson texts and VHS imperfections, the viewer is drawn into what initially appears to be a familiar, albeit dated version of accepted reality. 1983, the same year that Beyond the Black Rainbow takes place in, is the time. The tranquil forests of the Shadow Mountains is the place. Red and his partner Mandy live a peaceful existence that is forever altered by the Children of the New Dawn, a horrific cult with possible infernal entanglements. In the aftermath, Red sets about delivering a cruel revenge, both ensuring that his transgressors return to the void, but also allowing the viewer to embark on a visceral sojourn into the heart of grief. This idea is embodied by the one and only Nicolas Cage who portrays Red in the best performance of his fabled, perhaps even preternatural career. It would be easy to say that this is Mr. Cage at his most "Cage" with scenes of screaming, wild eyed hatred, and unrelenting sadness pervading the second act, however, it is the moments in between where Cage reveals the talent that he has always possessed, becoming a physical manifestation of Cosmatos' serpentine grief, a creature that he cannot shake that chases him through neon red corridors and hellish motel rooms. Mandy is a story about not only accepting loss, but living with the knowledge that death touches everything in the lives of the living. Those who survive will forever anguish and it is in how this is dealt with that is of import. The story is structured with two distinct acts. The first belongs to Andrea Riseborough's incomparable Mandy, showing her quaint, day to day life with Red and her haunted understanding of the world beyond. It is during her confrontation with the despicable Jeremiah Sand (Linus Roach in a career high turn) that the summation of her life is empowered, highlighting the subtle and powerful elements that define her in what is most certainly her darkest moments. The entire first act is languid, spinning into different directions while the real possibility of danger lurks just beyond Mandy's perception and yet, she refuses to relent to fear. 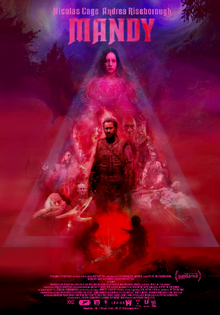 In Cosmatos' microcosm of homage and mysticism, Mandy is not a victim or a damsel, she is an avatar for everything that is worth fighting for. The second part has the surface level appearance of a revenge thriller, adorned with unspeakable accoutrements and foul advertisements from alternate dimensions. There are harbingers of sloth and excess that challenge Red, all the while setting up the final confrontation. Of note is Roach's Sand, who is a paradox of toxic masculinity and crippling doubt, the perfect summation of a creature that haunts the current wasteland of American ideals. The framework of Cosmatos and Aaron Stewart-Ahn's script is a hybrid, fusing the legend of Orpheus with demonic mythology to present an inverted Wonderland that is a totemic representation of finding respite in the face of tragedy. Legendary composer Johan Johannson's final score is a living apocalypse, combining the synth rhythms of the era with sharp guitar notes, yet another representation of the death of one era and the birth of another. The music melds with the violence, creating a kinetic field around the viewer that never relents, once the bloodletting begins. Everything is housed within Ilse Willocx's unspeakable set design. Each location is contrasted from the next, and yet, each one, no matter how mundane or revolting maintains a feeling of desolation that winds through every scene. Even the most humane scenes of Red and Mandy have an aura of dread that seems inescapable and perhaps this is Cosmatos' grand design. Benjamin Loeb's cinematography captures these elements in harrowing close ups and red filtered wide shots, as if hell itself is leaking into paradise. Many of Cosmatos' compositions have been compared to Frank Frazetta's art, marrying death metal sensitivities with a dark fantasy oeuvre. This is simulated by an unholy biker gang whose proclivities would make Clive Barker blush and the absolutely insane manner in which Red goes about his crusade. 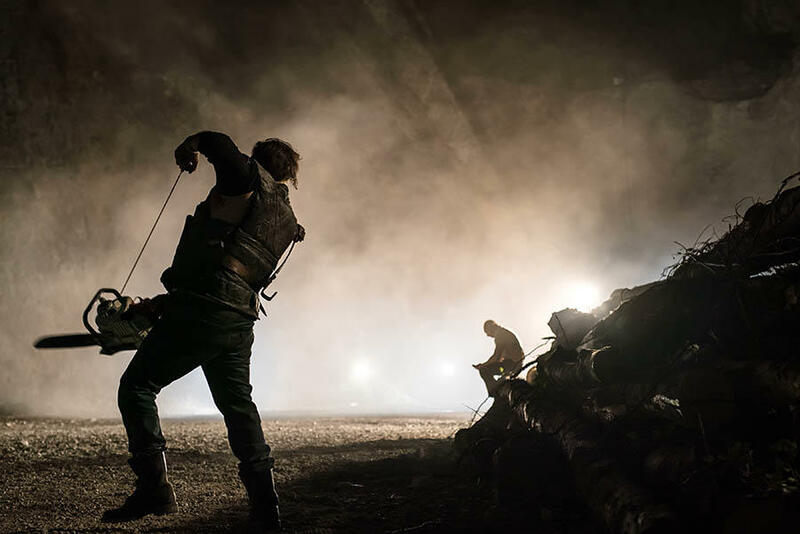 Cosmatos is not one to hide his influences, and Mandy continues the tradition of Rainbow by intricately displaying the director's passion for the past in each carefully constructed scene. It has been eight years since Cosmatos made a film and the reason why becomes clear with each masterfully presented sequence of torment. While there are countless themes and symbols strewn throughout, one concept that continually returns to the fore is cycles. On the surface, Red is embattled by the cycle of grief, feeling helplessness, rage, and ultimately an unsettling cool acceptance. Roiling beneath lies a cosmic accusation. Both Rainbow and Mandy use quasi supernatural elements to analyze both the depths and heights of humanity. This is best demonstrated during a climactic scene with Richard Brake's (31) unforgettable performance as The Chemist, a purveyor of preternatural narcotics, and quite possibly a disciple of Rainbow's Dr. Arboria. It is here that one of the film's major circles closes, and when it does, another one opens and this is the fundamental truth of Mandy. There is no hell, no pain, no darkness that cannot be overcome and it is the scars from these nightmares that ultimately define who we become in the light. Available now for digital rental, Mandy is a pitch-black opus of psychedelic madness. It is a film that will undoubtedly repulse viewers looking for any sense of a traditional viewing experience, however, those looking for something utterly unique will find much to treasure. A poisoned love letter to a decade out of time that is also one of the most honest films about love and loss ever conceived, Mandy is a masterpiece and one of the finest films of the century.